declares that we the people, by decree of law, shall save daylight. Where do you keep all of your yearly saved daylight? Do you put it in a daylight savings bank? Do you keep it under your mattress for a rainy day? in case I need it at night for an emergency. Seriously, how the heck are we saving daylight? By getting up earlier in the morning when it’s dark? By making the hour later when the sun goes down? when the sun is still shining at 9pm.? 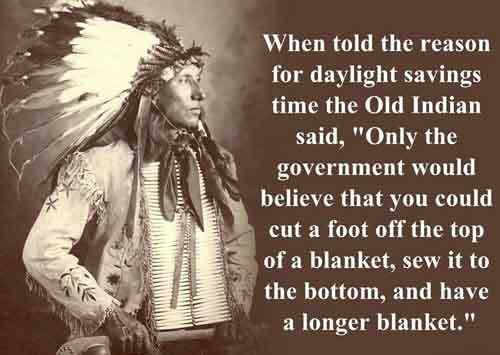 I know I’m beating a dead horse taking about the foolishness of Daylight Savings Time. We all know how it’s hard for the human body to adjust to sudden shifts in the way we measure time, twice a year. So I figure, if you can’t beat them, join them. Why not make some savings times for other natural events that we really have no control over. How about these time adjustments. You can pick an age to spring forward to or fall back on. Teeenagers can spring forward to vote, drive, drink. and spring forward when it’s time to pick up the social security check. Falling back would be very popular. Lose pounds before public appearances, doctors appointments, meeting old friends. Santa impersonators, competitive eaters, or for that matter anyone wanting to be in holiday eating shape. Very useful to fall back when pulled over by the police. Spring ahead when late for your destination. As long as we’re defying the forces of nature, why not save heat. Fall back in the winter to nice warm days. Spring forward in summer for relief from scorching heatwaves. Here’s one we could really enjoy. Fall back for adventurous days, hang gliding, new roller coasters, being a politician. Spring forward for exams, life decisions, let’s face it, everything. we could send it to Washington D.C.